Living at Gunpoint: A review of Woeser and Wang's "Voices from Tibet"
For over nine thousand years Tibetan nomads have skilfully managed their lives in the fragile environment of the high plateau. They raised limited numbers of livestock, which provided them enough to sustain their mobile civilization. This symbiotic relationship between nature and man never tipped to either party’s disadvantage. That’s until the red flag began to flutter against the blue sky of the Tibetan Plateau. The year 2009 marked half-a-century of China’s occupation of Tibet. In the same year, according to cables leaked by Wikileaks, the Dalai Lama told the then US ambassador to India that the international community should focus on the critical state of Tibet’s environment for five to ten years; the Tibetan leader reportedly said this was far more crucial than the political situation. ‘Melting glaciers, deforestation and increasingly polluted water from mining are problems that cannot wait,’ the Dalai Lama said. Despite the Tibetan Nobel Laureate’s emphatic appeal little is being done. In fact the scale of mining on the plateau has increased manifold and since 2008 China has effectively banned the international media’s entry into Tibet. Today North Korea is more accessible to foreign journalists than Tibet said professor Carole McGranahan of the University of Colorado and the author of Arrested Histories: Tibet, the CIA, and Memories of a Forgotten War. 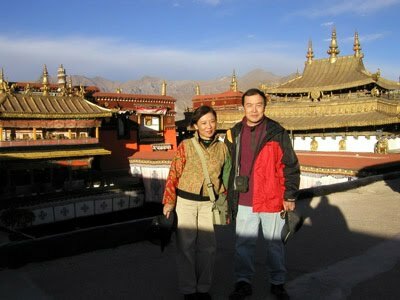 At such a worrying time, the voices of Beijing-based Tibetan author and blogger Woeser – and her Chinese husband Wang Lixiong – are crucial in creating a vital communication link between Tibet-under-China and the free world. Voices from Tibet: Selected Essays and Reportage by Woeser and Wang Lixiong, jointly published by Hong Kong University Press and the University of Hawai’i Press, is an urgent and timely book. The authors’ courage in expressing their dissenting views on Tibet is matched by the authenticity of their reportage on wide-ranging concerns such as demolition of historical buildings in Lhasa, forceful resettlement of nomads, mining, self-immolation and flooding of Chinese migrants into Tibet – many of whom engage in crass and barefaced appropriation of Tibetan culture and religion to make quick and easy money. 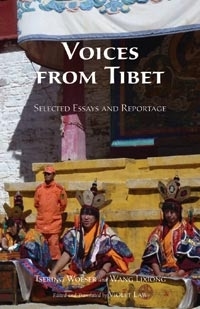 Forty essays are thematically arranged in five sections – Old Lhasa Politicized, Economic Imperialism with Chinese Characteristics, Religion Under Siege, Wrecking Nature, and Culture Twisted, Trampled – to provide a clear picture of daily Tibetan experiences under the machinery of authoritarian rule that Woeser and Wang describes as ‘grounded on rigid structure and ruthless logic’. The defining appeal of the book is the legitimacy of the couple’s writing. The authors are no armchair commentators. They have put their lives in danger by traveling to many places on the Tibetan Plateau to gather accounts of people and places most affected by dictates from Beijing. Soon after Tenzin Delek Rinpoche was sentenced to death in December 2002 with a two-year reprieve for his alleged possession of explosives, Woeser made a trip to Rinpoche’s homeland deep inside Kardze in Kham to find out about the Chinese authorities’ claim to have found ‘bombs’ hidden a ‘secret compartment’ in his house. Woeser found out that to build his new residence, Rinpoche – like many others who constructed houses in that region – used explosives to level a piece of land located at a ravine. Some unused sticks of dynamite were stored in a ‘space between the rugged slope and the wall panels of the house’. These were what the police found which led to Rinpoche being handed down the death sentence, later commuted to life in prison. Woeser and Wang also write about ‘charlatan lamas’ and tulkus stationed in monasteries charging exorbitant prices from unsuspecting tourists for phony future predictions and fake puja ceremonies. When visitors ran short of cash, they would say, ‘No problem, we take credit cards here.’ These operatives are Tibetan-speaking Chinese from tour companies that have colluded with local religious bureaus which issue them permits to set up bases and business in major monasteries. For exile Tibetans and the international community, Woeser and Wang’s essays are perhaps the most reliable source of information on Tibet that still continues to flow through many channels such as books, blogs, press interviews and social media. Many other Tibetan writers such as Theurang, Dolma Kyab and Kunchok Tsephel who have articulated national aspirations are serving various sentences – some as long as fifteen years – in Chinese prisons for their writing. Though Woeser and Wang are facing threats, harassment, house arrest and being tailed daily, they have managed to avoid being put behind bars thus far. There is however real danger that, like their friend and Nobel Laureate Liu Xiaobo who is serving eleven years in jail for his role in drafting Charter 08, their days may be numbered. It is long overdue that the CCP listens to the voices of this brave couple and realize that their articulation carries the weight of every person on the plateau whose voice is stifled and whose aspiration for freedom rebutted with bullets and armoured vehicles. Voices from Tibet is an incisive and an urgent book that must be read by anyone who has an interest not only in Tibet and China but also in the struggles for freedom elsewhere in the world. If any record of oppression can fend off state-sanctioned collective amnesia, it is this.